Although some of the athletes competing in Rio this year are seasoned Olympians, there are also many newcomers to the games. Of the five gymnasts competing on the U.S. women's team, for example, three — Simone Biles, Laurie Hernandez, and Madison Kocian — are first-time Olympians, although they've been active in the gymnastics world for years. On Monday, Aug. 15, just before the women of Team USA competed against each other in the balance beam event, Biles shared a pre-Olympics photo of Hernandez and herself from what looks to be years ago. "Funny thing is back then we never thought we would be competing at the Olympics," Biles said on Instagram. "Crazy how things happen, so excited to be competing in the Beam Finals today with this girl." 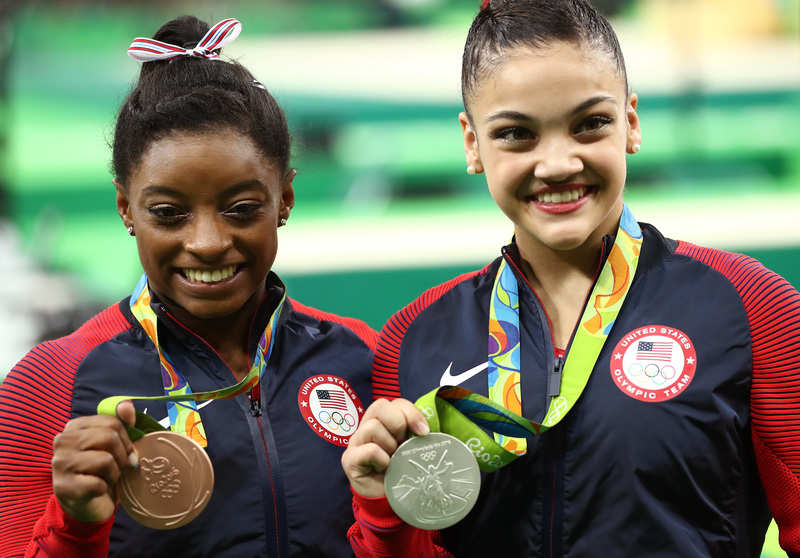 It's unclear how old Biles and Hernandez were when the shot was taken — they were definitely much younger than they are now — but it's clear that the pair have been training together for a long time. At 16 years old, Hernandez is the youngest member of the U.S. gymnastics team — Biles, who is just three years older than her, is the third-youngest. Their hard work has obviously paid off. Biles began practicing gymnastics at the age of six and won her first gold medals at the age of 16, during the 2013 World Artistic Gymnastics Championships in Antwerp, Belgium. Since then, she's been on a nearly-unbeatable winning streak: she's won four titles at the Rio Olympics alone, three of which were gold medals. Hernandez has been in the game for just as long. A recently-unearthed video of an 8-year-old Hernandez's childhood floor routine shows she's been a force to be reckoned with since the very beginning. On Monday afternoon, Hernandez and Biles both took home medals during the beam finals. Hernandez scored a 15.333 in the beam competition, securing the silver medal — and Biles, who up until this point has had an uncontested winning streak, wobbled a bit but nonetheless received a score of 14.733 and won the bronze. Although neither gymnast took home the gold, both were more than pleased with their Olympics successes. "I'm not disappointed in the medal that I received, because anyone would love to have a bronze at the Olympic Games," Biles told NBC after winning the bronze medal. "But I'm disappointed in the routine that I did and not so much the entire routine, just the front tuck, I guess. Because the rest of the routine was pretty good." Biles will be competing in the women's floor finals Tuesday, Aug. 16 — and she'll no doubt be cheered on by Hernandez and her other teammates. If her performance is anything like it's been throughout the course of the games, she'll be golden.